Rain or shine, ponies still need to be fed and vet bills paid. Because of this we cannot schedule rain-dates or back-up dates in advance, and we cannot refund booking fees. However we do offer you the option of converting your party to our available alternate entertainment choices in case of poor weather. Local parties have the option of rescheduling their pony party for a (one) non-holiday weekday makeup date, and anyone can use their booking fee against a photo session/farm visit with our ponies and the birthday child at a local park during the week. Full party fees will be due at the moment we load the trailer with the ponies. Up until the point we load the ponies, you are entitled to a fee adjustment, if applicable, if you select a face painting party/glitter tattoos alternative, and/or balloons if our twister is available. If we determine at any time within the 24 hour window before the party that weather has made it impossible or unsafe to proceed and return with the rig and ponies, we will offer the option of a face painting/glitter tattoo party if conditions allow a passenger vehicle to be safely driven to and from your party location with no chance of stranding. If a threatening forecast (i.e. hurricane track) was in place at that 24 hour mark and you elected to proceed in the face of it and the above aforementioned conditions apply, you have waived your booking fee. If you choose to use your deposit as a credit for an alternate day or alternate service because of weather concerns - at that point your booking fee no longer entitles you to the original service and time. We are a business and booking fees do not pay our staff, so the moment you choose an alternative, we will be booking staff for indoor events or charities that will enable us to do business there, or going to our waiting list if better weather is certain at another client's locatoin. At that point our commitment is to them. If you have a change of heart, of course we will do our best to accommodate your needs as we want only happy campers as clients and we want to please you as much as is practically possible. Cancellation of weekend parties for reasons other than weather will incur full fees if cancelled closer than two weeks prior to your party and the same time slot cannot be filled by another party. We welcome all face painting and balloon twisting bookings, regardless of season. If the weather agrees and we can convert or add ponies to your booking, we would be more than happy to at that point. Your email commitment is your contract - please peruse our site and read our FAQ to ensure your complete satisfaction with our business practices before booking your party. We love pleasing our customers! Ponies are hardy, as are children. Children will rarely understand the need to cancel, and so long as the roads are passable we will not let them down. We can give pony parties in light rain (although fragile costumes and tack may be substituted with sturdier stuff), or in your garage if need be. One determined hostess erected a tent! Thunder and lightning mean we will retreat until the weather blows over (time permitting) or if your garage is an option, use it. Clients in areas south and east of us might keep in mind that our weather conditions, especially temperature impacting ice and snow accumulations, can vary greatly in a thirty mile band. This is our main source of income - we want to work. We will NEVER reschedule your party out of convenience, as a hobbiest might. Rest assured that if safe passage is possible, we will be there. 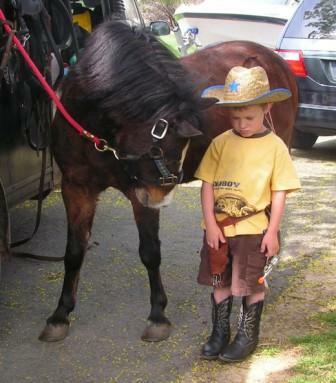 We take our pony care very seriously, as well as our public image. The status of animals for entertainment is tenuous in this society and we certainly don't want to be a lightning rod for any malicious attentions from animals 'rights' groups who wish to take our rights to enjoy the companionship of animals from us through their lobbying efforts. In any situation, animal welfare is paramount. Policies for our services at your party can be found on the F.A.Q. page, which you MUST read as a condition of our contract. Nobody likes to cancel a pony party! Safety is our first priority. We reserve the right to pack up and go home in any unsafe situation, at our judgment. For the sake of the children, 99.9% of the time we elect to perservere regardless, in which case you may perceive that your experience is not what you expected. Please understand that if we are preoccupied with managing an unsafe situation caused by the client defaulting on their contract, that our demeanor may reflect the strain of that effort but know that we are doing our best to not punish the children for the adults' lack of oversight.